Sometimes these GIJoe packs really confuse me: how do they decide which figures to put together? The Iron Grenadier troops are raiding a secret depot for the U.S. Air Force's most advanced air-to-air missile guidance systems. It is imperative that the guidance chips and software not fall into the hands of Cobra Troops. It's up to Lady Jaye to masquerade as the Baroness by using her SpyTroops disguise so that she can substitute a fake chip corrupted with a virus for the one the Iron Grenadier troops have stolen. Educated at Bryn Mawr and Trinity College Dublin, Lady Jaye brings a touch of class to the GIJoe team, along with a tough no-nonsense attitude, remarkable skills with edged weapons and a left-hook with no mercy. Ranger qualified, she maxed the intelligence course at Fort Holabird and has taught Russian, Urdu, Polish and Afghani at the Defense Language Institute. Lady Jaye doesn't believe in the wig and makeup school of undercover. She believes in becoming the subject by intense immersion in speech patterns, body language, and general attitude. Lady Jaye, like Scarlett, was one of the driving forces for women's equality in the minds of '80s-era kids. An accomplished field commander, skilled pilot and first-rate spearchucker, Lady Jaye was more than the military mattressback advisor she could have been. Sure, she sounded like a 40-year chainsmoker, but it worked for her. Worked for Flint, too, if you know what I'm saying. Lady Jaye's classic uniform has been updated for the new line of figures: she's still wearing the green jumpsuit that fans remember, but it looks more impressive today. A pair of holsters on her hips holds the included guns, although (for a change) the weapons are a bit too small for the figure and have a tendency to fall out. Hasbro's sculpting problems seem to have resurfaced with Lady Jaye: a fairly decent sculpt, definitely more feminine than her original version, Lady Jaye still suffers from the tiny head syndrome that plagued so many of this line's figures. Other than the microcephalic head, she's great. Since Lady Jaye was a master of disguise, it just makes sense that she'd get the SpyTroops equipment in this set. To help her infiltrate Cobra, she can disguise herself as the Baroness: a few sections of black leather body suit and a mask that fits on her tiny little face help sell the illusion. Still, I don't think many Cobra agents would mistake her for the real Baroness, so let's hope she's quick with those guns. Recruited from the ranks of the elite forces of Destro, the Iron Grenadier trooper is chosen for his endurance, tenacity and pure meanness. The Iron Grenadier is the key to the expansion of the armament business that Destro governs. This group is capable of infiltrating anywhere virtually undetected, they spread panic and chaos, undermine authority, and encourage disagreements, creating a greater demand for the weapons that Destro sells. In fact, his pay is a commission on the armaments that are sold because of his efforts. The Iron Grenadier gets special incentive points for starting riots, encouraging armed revolts and igniting brush wars. Every would-be conqueror needs his ranks of generic shocktroops, and Destro has the Iron Grenadiers. 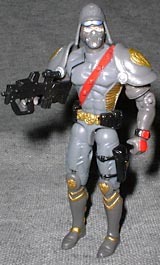 Though they're presented on the file card as something like obnoxious salesmen with guns, the Grenadiers also serve as Destro's personal guard and as elite Cobra troops. The Grenadier's armor is very nicely designed for these figures. All silver and gold, the suit is both stylish and functional - there's a bright red studded bandolier running across his chest and even his faceplate is cool. There are two big Cobra emblem shoulder pads and a helmet included with the figure, as well as an Israeli Tavor MTAR-21 machine gun and a pistol. The Grenadier was previously available with darker armor in a SpyTroops two-pack beside Recondo. That Grenadier included a mortar launcher instead of this version's oversized handgun. This set turned out to be better than it could have been - the Grenadier isn't a total letdown - but it still would have made much more sense to have Destro and Lady Jaye together in the blister. What does "Lady Jaye" mean, anyway? Tell us on our message board, The Loafing Lounge.